How many emperors does it take to run an empire? Diocletian tried four with reasonable results. How did six work out? Well on the whole not too well, and it was pretty obvious pretty quickly that one of them in particular was surplus to requirements. Certainly having two close to each other didn’t seem to be ideal. Although there is a good case to be made that the skill and experience of long serving Maximian had saved both Maxentius and Constantine from being overrun by Severus, it soon turned out that once the crisis was over, his presence in Rome was a bit of an embarrassment. It had been Maxentius that had been acclaimed by the Senate and people as emperor. And frankly, how many of us would actually want our Dad turning up to tell us how to do our job? Especially if he had done the same job himself pretty successfully for twenty years. 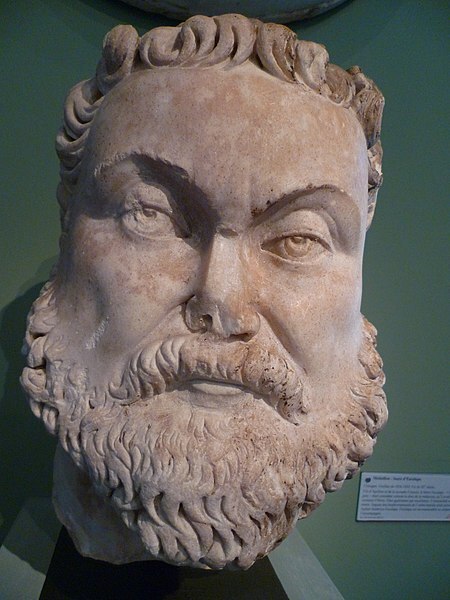 Maximian was persuaded to give up his position for a second time and retired to Illyricum. Illyricum was part of Galerius’ portion of the empire. But it turned out that Galerius was no keener on having his former colleague around than his son had been. Maximian was on the move again, and this time turned up at the court of his son in law Constantine in Gaul. This worked out okay for a while. But Maximian still hankered after the top job. While Constantine was away at the borders dealing with a barbarian incursion, Maximian spread a rumour that he had been killed and assumed the supposedly vacant throne himself. He instantly raided the imperial treasure which he cheerfully dished out to the local troops to ensure his third run at being an emperor got off to a good start. Some people just don’t know when to stop. Next time a more senior member of your family fiddles with your central heating settings, or points out the poor fuel economy of your latest choice of motor vehicle, think how much worse Constantine had it. In fact, Constantine was having none of it and rapidly returned with an army large enough to deal speedily with the situation. Maximian fled to Marseilles and attempted to defend it against Constantine – though what his long term plan was by this stage is hard to work out. The defenders soon saw the hopelessness of the situation and simply handed over Maximian to Constantine. Constantine executed him. Or to be precise allowed him to end his own life by strangling himself. An ignoble end to an illustrious career. But he had had a good life. Constantine, as was standard practice under the circumstances, had the name of Maximian removed from public monuments and had all his statues thrown down. His body, swelled by an intemperate course of life to an unwieldy corpulence, was covered with ulcers, and devoured by innumerable swarms of those insects which have given their name to a most loathsome disease. This doesn’t sound like much fun, and seems to have slowed him down because he spent the last years of his life enjoying himself. He did get a big irrigation and forest clearance scheme done near the mouth of the Danube, so it wasn’t a complete waste of a reign, but nonetheless for someone who had been so active early in his career he does seem to just peter out towards the end. His two junior emperors squared up for a war over his position, but in the end managed to agree a division of the spoils between the two of them. This reduced the number of emperors back down to four. Maximin took Egypt and Syria while Licinius had Asia Minor of the Balkans. Nobody considered it necessary to fill the post left vacant by the death of Galerius. Meanwhile the death of Maximian was having repercussions. His son Maxentius had found his father intolerable when he was alive and in Italy. Now that he had been killed and insulted in Gaul, Maxentius developed an affection for the old man. He called for the destruction of Constantine’s statues in retaliation and prepared a sizable army to invade Gaul. Now, this wasn’t really the smartest of tactical moves. Maxentius had bigger problems on his hands than a bit of disrespect to his father, especially when it was frankly so richly deserved. For a start he was threatened by the considerable forces of Licinius, and had to station a large body of troops at Verona to deter him. Although Maxentius had come to power with a large fund of goodwill, he expended that goodwill pretty quickly. He had been picked by the people as a champion to oppose the imposition of taxes. But he had in fact raised them anyway. As is often the case it wasn’t difficult for discontent with the tax policy to transfer to dislike of the person raising the taxes. But Maxentius does sound like a particularly unpleasant individual. He wasted the whole province of Africa in revenge for a minor rebellion by some officials. He extracted cash from senators in the guise of a ‘free gift’ and ravished whatever woman took his fancy, including the wives of prominent citizens. But he was in a strong position, on paper at least. His military resources were extensive. His army was in the region of 170,000 foot and 18,000 cavalry. The granaries were full. And Italy of course did not have any serious danger of invasion by barbarians. The forces of Constantine were not only a lot more modest, he also had to allow for defending borders in Germany and Britain. It is little wonder that when delegations from the city of Rome sought him out and sought his aid against their tyrant, he was reluctant to risk his own position no matter how much he sympathised with their plight. But nonetheless, Maxentius seemed set on war. So like it or not Constantine had to fight. He chose a most ambitious course of action. Rather than waiting for the superior forces of Maxentius to concentrate and invade his territory, he would invade Italy. Since he had to leave a substantial number of troops behind to cover the frontier this meant he would be at an even bigger disadvantage in terms of numbers. But it meant he had the initiative, which enabled him to choose the time and place of the battles, initially at any rate. He had about a quarter the forces, but at least his troops were veterans and he himself was an experienced commander. These advantages were evident early on. He was able to move so quickly that he appeared before the city of Susa at the foot of the Cotian Alps before news of his departure from Gaul had reached Rome. And Susa was taken quickly. The gates were burned down, and ladders used to scale the walls. This was an army that knew what it was doing and was to continue to show a high degree of professionalism throughout the campaign. Advancing to Turin he encountered a large force including heavy cavalry which might easily have done enormous damage to his infantry. But from his previous experience in the east Constantine knew how to effectively deploy his troops to defeat what might have been a potent weapon against another general. Constantine was victorious and significantly as the troops of Maxentius retreated to Turin they found that the city had gone over to the side of Constantine. The gates were shut against them and they were massacred. Other cities in the region followed suit and Constantine was soon in charge of most of northern Italy. Taking up quarters in the imperial palace in Milan he was only 400 hundred miles from Rome. But Maxentius was still far from being out of the game. He still had a large army at his disposal in Rome and his Praetorian Prefect Pompeianus occupied Verona. Constantine could not advance on the capital until he had dealt with that threat and laid siege. But Verona was no easy target and Pompeianus no pushover. Being surrounded on three sides by a river and heavily defended a siege could have taken a long time, and Constantine’s only hope was in speed. A long war of attrition would inevitably lead to the victory of his better resourced adversary. Pompeianus was not particularly patient either. He slipped out of the city and raised a large enough force from the surrounding district to force Constantine to either withdraw or fight a pitched battle. As he was outnumbered this was a courageous move, especially when the opposing forces met and the Italians proved to have so many more men that their line was considerably longer. But Constantine’s veterans were able to carry out a skilled manoeuvre to extend the line at the last minute. Night fell shortly after battle commenced and continued through the night. As the dawn broke the next day the superior fighting qualities of the Gallic legions had proved decisive. Pompieanus was among the dead. Verona surrendered. This victory gave Constantine the initiative once again and he was now able to advance towards Rome. But even so, his position was still far from overwhelming. Rome was a large city and well supplied with food, and there were still plenty of troops following the banner of Maxentius. The outcome of a long siege would be hard to predict and might give another emperor the opportunity to intervene. But the men around Maxentius were facing the same problem. They believed that they did not need to resort to the fortifications of Rome. They had sufficient forces to defeat Constantine in the field. To give this strategy the greatest chance of success the prestige of the emperor himself would be needed leading the army in person. Maxentius was not blessed with the kind of grit his father and his opponent showed and was reluctant to risk his presence on an actual battlefield. But the Roman people made their views clear with demonstrations outside his palace and cat calls at the games. As Gibbon puts it, shame supplied the place of courage. But he should have cause for optimism. The third army that took the field against Constantine was the largest yet and should have been able to halt the invasion. But it was not to be. The two armies met at a village called Saxa Rubra about nine miles outside Rome. The smaller size of Constantine’s forces was compensated for by their battle hardiness and the valour of Constantine. He personally lead a decisive cavalry charge. The Italian cavalry was driven from the field leaving their infantry exposed on the flanks. Panic ensued. They had their backs to the river Tiber and were unable to retreat in good order. One small bridge, the Milvian Bridge from which this battle takes its name, was the only way to escape and was not big enough to allow more than a handful across at a time. Many were killed by the press of the crowd or fell into the river. One of the casualties was Maxentius himself who the next day was pulled out of the river. His heavy armour had weighed him down and like many others he had drowned. The Praetorian Guard had been strong supporters of Maxentius and fought with courage and later desperate determination after the day was lost. Their bodies were found in their lines. They at least had not tried to escape. The Praetorians had been throughout their history at various times arrogant, greedy, foolish and cowardly. This is almost the only time their behaviour does them any credit at all. One of the first acts of Constantine on becoming the undisputed leader of the western half of the Roman Empire was to abolish the Praetorian Guard. The survivors of the battle of the Milvian Bridge were distributed to other legions and their camp leveled. With the exception of their last battle they had almost nothing to commend them to history. Even at their best they were the hired thugs of despots. Often they saddled the empire with some of its most unworthy leaders. This is the last we will hear about them and we won’t miss them. Quite apart from their questionable history, they were now surplus to requirement. Their role was to guard the emperor and the emperor was now no longer at Rome. The loss of the Praetorian Guard was in that sense another symptom of the decline of Rome’s importance. Constantine went through the process of addressing the Senate, who in turn acted out a charade of giving him important honours. Games and festivals were created to ensure the long memory of his victories. Monuments commissioned by Maxentius were rapidly rededicated to the new man in charge. One particular project reveals the depths to which the city that had conquered the world had now fallen. No craftsman could be found with the skill to decorate a triumphal arch dedicated to Constantine. Instead, some friezes were simply lifted from the arch of Trajan. The events depicted were of course completely different to those being celebrated, and some even showed Trajan himself. If the Senate thought such flattery would at least get them out of ponying up the levies that Maxentius required of them, they were disappointed. Senators would now have to pay for the privilege of sitting in the Senate. Constantine’s behaviour towards the family and supporters of Maxentius was standard for the time. His children and everyone else closely connected with him was killed. The aim was to prevent descendants of Maximian challenging for the throne in the future. Key supporters were killed as well. But it wasn’t a major bloodbath and was no more or less than he would have expected had he himself been beaten. But Constantine did not stay in Rome long. There was still politics to be done. He had arranged the marriage of his sister Constatia to Licinius, part of a bigger alliance deal needless to say, so he was off to negotiate the details in Milan. Rome was left now without any troops, without a resident emperor and on the sidelines with no particular role in the empire that bore its name. The citizens probably wondered if there was any insult left for Constantine to throw at the nominal mistress of the world. In a few years time they were to discover that in fact, there was.